The low-cost airline has flown into the red, but is taking 'decisive action'. Flybe is in the midst of a turnaround and it’s not pretty. The low-cost regional airline announced today it was selling off its 60% stake in its loss-making Finnish joint venture to Finnair for the measly sum of €1 and cancelling an order for 20 aircraft. It made a pre-tax loss of £15.3m in the six months to September 30th, due to a £9.9m impairment of the Finnish business, a £6m provision for payouts for delayed flights, £10.4m of restructuring costs and an £8m loan revaluation (MT gets travel sickness just reading that list). That doesn’t make for a happy comparison to profits of £13.8m last year. Nor do revenues, which tanked 12.3% to £307.8m. Shares duly plunged more than 17% to 109p in mid-morning trading - not a pretty sight for the revamped management, especially as they had risen more than 26% in the last year before today. 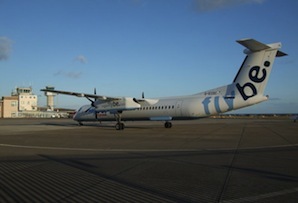 ‘We are making significant progress in addressing the legacy issues within the business, which will ensure we operate with a simpler business model,’ said chief exec Saad Hammad, who was parachuted into the business in August 2013 when veteran Jim French stepped down after 12 years in the pilot’s seat. And to be fair to Hammad he is refocusing on the airline’s core UK market, announcing new bases at Aberdeen and Bournemouth and flights from Stansted, all launching in March 2015. That comes after Flybe unveiled a tie-up with Aer Lingus on Monday that means passengers can get from Inverness or Exeter to North American destinations, including New York, via Dublin. In October, it announced five new regional routes from London’s City Airport. Another encouraging sign was passenger revenue per seat, a closely watched measure of profitability in the airline industry, which rose 8.7% to £54.75. But unless Hammad’s ‘decisive action’ translates into better numbers soon, he may well find himself looking for a parachute.